Talmudist and cabalist; born, probably at Mayence, about 1176; died at Worms in 1238. He was a descendant of the great Kalonymus family of Mayence, and a disciple of Judah he-Ḥasid, who initiated him into the study of the Cabala, at that time little known in Germany. 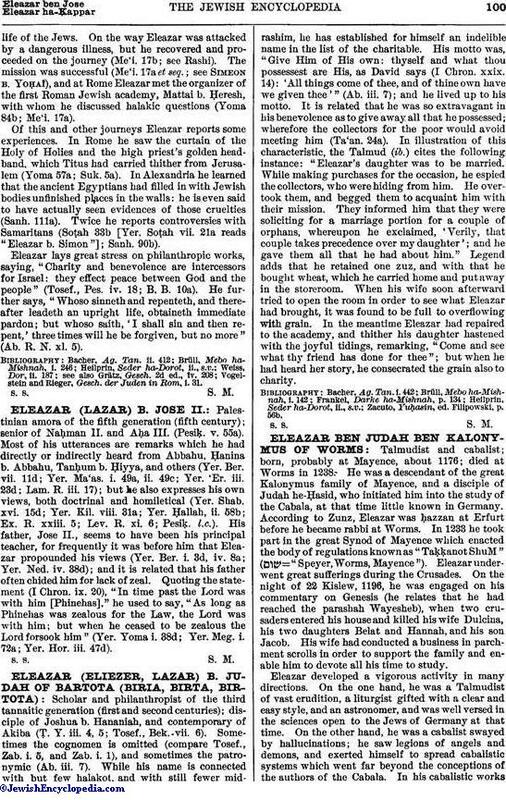 According to Zunz, Eleazar was ḥazzan at Erfurt before he became rabbi at Worms. In 1233 he took part in the great Synod of Mayence which enacted the body of regulations known as "Taḳḳanot ShuM" ( = "Speyer, Worms, Mayence"). Eleazar underwent great sufferings during the Crusades. On the night of 22 Kislew, 1196, he was engaged on his commentary on Genesis (he relates that he had reached the parashah Wayesheb), when two crusaders entered his house and killed his wife Dulcina, his two daughters Belat and Hannah, and his son Jacob. His wife had conducted a business in parchment scrolls in order to support the family and enable him to devote all his time to study. Eleazar developed a vigorous activity in many directions. On the one hand, he was a Talmudist of vast erudition, a liturgist gifted with a clear and easy style, and an astronomer, and was well versed in the sciences open to the Jews of Germany at that time. On the other hand, he was a cabalist swayed by hallucinations; he saw legions of angels and demons, and exerted himself to spread cabalistic systems which went far beyond the conceptions of the authors of the Cabala. In his cabalistic workshe developed and gave a new impulse to the mysticism associated with the letters of the alphabet. The philosophical Cabala of the school of Isaac the Blind is replaced by arithmetical speculations. By the gemaṭria and noṭariḳon systems of interpretation found in the Talmud, Eleazar invented new combinations by which miracles could be performed. The haggadic anthropomorphism which he had combated in his earlier works ("Ha-Roḳeaḥ," "Sha'are ha-Sod weha-Yiḥud") occupied later the foremost place in his cabalistic writings. Eleazar's great merit lies not in his new cabalistic system, but in his ethical works. In these he shows greatness of soul and a piety bordering upon asceticism. Though so severely tried by fate, he inculcates cheerfulness, patience, and love for humanity. Eleazar's ethical works are: (1) Ha-Roḳeaḥ," on the numerical value of the word , corresponding to that of (= 308). It is divided into 497 paragraphs containing halakot and ethics; first published at Fano, 1505. (2) "Adderet ha-Shem," still extant in manuscript in the Vatican Library. (3) "Moreh Ḥaṭṭa'im," or "Seder ha-Kapparot," on penitence and confession of sin, first published at Venice, 1543. This work, which is included in the Hilkot Teshubah of the "Ha-Roḳeaḥ," has been reproduced many times under various titles. It appeared under the title "Darke Teshubah" at the end of the responsa of Meïr of Rothenburg in the Prague edition; as "'Inyane Teshubah," or "Seder Teshubah," in the Sephardic ritual of 1584; as "Yesod Teshubah," with additions by Isaac ben Moses Elles, first published in 1583; as "Yore Ḥaṭṭa'im ba-Derek"; and as "Sefer ha-Kapparot." The title adopted here is the same as that given in the "Kol Bo," in which the work was reproduced. (4) "Sefer ha-Ḥayyim," treating of the unity of God, of the soul and its attributes, and of the three stages (recognized by the ancients as "plant, animal, and intellectual") in man's life. (5) "Sha'are ha-Sod ha-Yiḥud weha-Emunah," a treatise on the unity and incorporeality of God, combating the anthropomorphism of the Haggadah (published by Jellinek in the "Kokabe Yiẓḥaḳ" collection [xxvii.]. Eleazar's mystical works are: (1) "Yir'at El," still extant in manuscript in the Vatican Library, containing mystical commentaries on Psalm lxvii., on the Menorah, and on Sefirat ha-'Omer. (2) "Sefer ha-Kabod," mystical explanations of various Biblical passages (Neubauer, "Cat. Bodl. Hebr. MSS." No. 1566, 1). (3) "Yayin ha-Reḳaḥ," mystical commentaries on the five Megillot. Those on Ruth and the Song of Songs were published at Lublin, 1608. (4) A commentary on Psalm cxlv. (MS. De Rossi No. 1138). (5) A commentary on the prayers mentioned by Joseph Delmedigo in his "Maẓref la-Ḥokmah" (p. 14b). (6) "Ta'ame we-Sodot ha-Tefillah" (Neubauer, ib. No.1575.) (7) "Perush 'al Sefer Yeẓirah," a commentary on the "Yeẓirah," being extracts from Shabbethai Donnolo's commentary. Fragments of this work were first published at Mantua in 1562, later in several other places; a complete edition was printed at Przemysl, 1889. (8) "Midrash we-Perush 'al ha-Torah," cabalistic commentary on the Pentateuch, mentioned by Azulai. (9) "Sha'are Binah," in which, interpreting Biblical verses by the system of gemaṭriyyot, he shows the origin of many haggadot of the Talmud. This work is frequently quoted by Solomon al-Ḳabiẓ, in his "Manot ha-Lewi." (10) "Shi'ur Ḳomah," a commentary on the "Shi'ur Komah," the "Pirḳe de-Rabbi Yishma'el," and the "Merkabah" (MS. Michael). (11) "Sefer ha-Ḥokmah," cabalistic treatise on the various names of God and of angels, and on the seventy-three "Gates of the Torah" ( ). (12) "Sefer ha-Shem," mystical dissertations on the names of twenty-two letters, with a table of permutations (Neubauer, ib. No. 1569, 4). (13) "'Eser Shemot," commentary on the ten names of God (MS. Michael, No. 175). (14) A commentary on the piyyuṭ "Ha-Oḥez." (15) Six small cabalistic treatises entitled "Sod ha-Ziwwug," "Sefer ha-Ne'elam," "Sefer Mal'akim," "Sefer Tagim," "Sefer Pesaḳ," and "Sefer ha-Ḳolot," all of which are still extant in manuscript (Neubauer, ib. No. 1566). (16) "Liḳḳuṭim," cabalistic fragments, mentioned by Recanate. (17) "Sode Raza," a treatise on the mysteries of Cabala, particularly on the "Merkabah." Part of this work was published at Amsterdam in 1701, under the title "Sefer Razi'el ha-Gadol." In the introduction the editor says that he decided to publish this book after having seen that the greater part of it had been produced in French under the title "Images des Lettres de l'Alphabet." 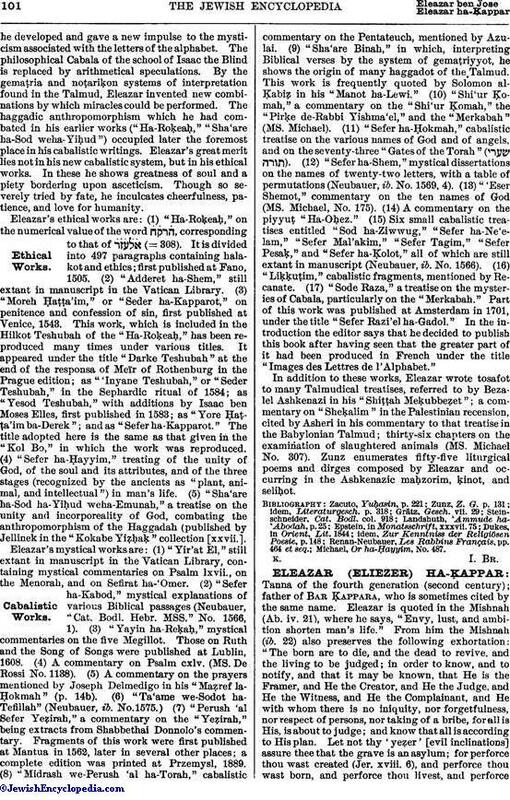 In addition to these works, Eleazar wrote tosafot to many Talmudical treatises, referred to by Bezalel Ashkenazi in his "Shiṭṭah Meḳubbeẓet"; a commentary on "Sheḳalim" in the Palestinian recension, cited by Asheri in his commentary to that treatise in the Babylonian Talmud; thirty-six chapters on the examination of slaughtered animals (MS. Michael No. 307). Zunz enumerates fifty-five liturgical poems and dirges composed by Eleazar and occurring in the Ashkenazic maḥzorim, ḳinot, and seliḥot. Michael, Or ha-Ḥayyim, No. 487.